Hello all. Wow, 2 posts in a row lol that is something new lately!!! :) I was able to get into my space again and got to playing with the new set Sweetbriar Rose. This is a great stamp to use with the new Blendabilities markers that SU! now has. The markers aren't currently available to the public (I know, it's super sad) but they should be shortly. Once they are... trust me you are going to LOVE them. Stampin' Up! in the new catalog has an entire section of stamps that are great for coloring. I decided to do some simple layering with this card having the base being Whisper White and then taking a sponge and some Cherry Cobbler ink around the edges. To give it a bit more dimension and to bring out the color in the flower. The flower is using the Cherry Cobbler Blendabilities as well as the Old Olive Blendabilities. I then used a piece of the new Flowerpot DSP (AMAZING) and sponged those edges with the Black Memento ink. Black Memento is a new stamp pad that is now available because it needs to be used with the Blendabilities. If you tried to use the regular Basic Black stamp pad or even the StazOn the ink from the blendabilities would run and not stay within the lines. Just a little food for thought! 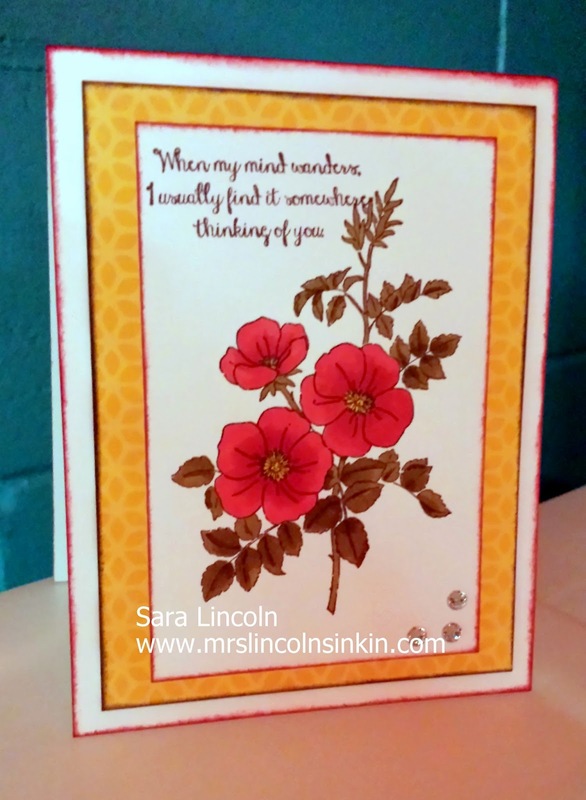 :) The greeting that i used is from another new set called Bloom with Hope, a new hostess set that is available. You can receive this set 2 ways, you can either place an order that is at least $150 (before s/h and tax) or you can have a party, whether it be a catalog party or an actual party, and you sell at least $150 worth of product. The item that i am showcasing today is the Sweetbriar Rose set. It is a single stamp that comes in wood mount only.